Large touch screen for information and advertising. Interactive solution, adaptable to all types of businesses. 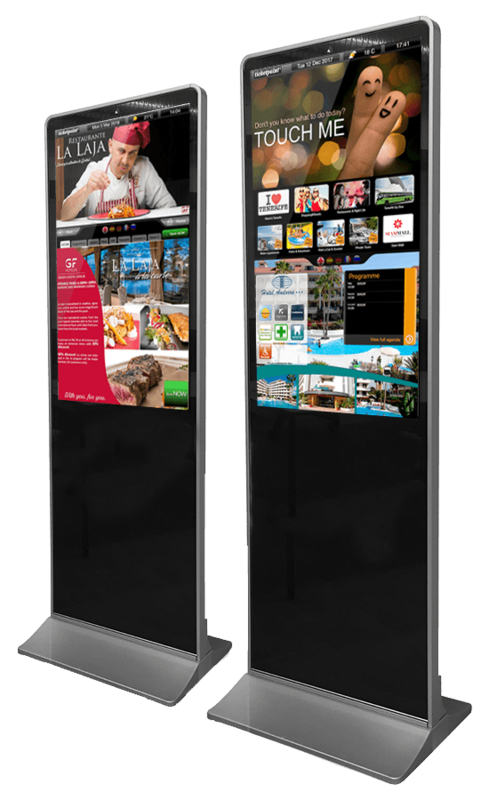 TicketPoint Interactive Kiosks are the definitive tool to improve communication between your company and your customers. Offer your clients direct and visual information about all products and services available, accompany the information with offers and promotions that help improve sales. Everything you can imagine is supported by our software (videos, animations, maps, screens, agendas) and much more. Thanks to our powerful reservation and realtime availability engine, customers can make reservations for your restaurant, gym or activities, thus reducing the workload of your staff. 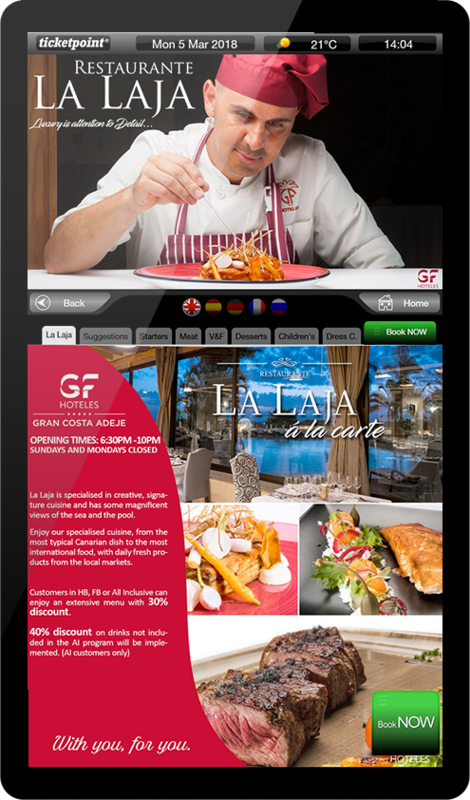 If you prefer you can include a catalog of services or restaurant menu. Control as many kiosks or screens as you want remotely, thanks to our powerful management software in the Cloud, with which you can manage all the content of your kiosks, or if you prefer and for a small fee, our marketing staff will be responsible to update and program for you, all the screens and kiosks according to your criteria and needs. General information about the establishment and its services. Information on the trade sustainability policy. Information of general interest about the area or activities. Information with maps and directions on how to get around the establishment and area. Full information weather forecast for the next days. Updated information on offers and promotions in real time. Updated information on flights, arrivals and departures. Automated check-in for your guests. Avoid waiting in line and save time, by buying from our ticketing kiosk. Automated quality questionnaire for your clients and visitors. Information about awards or quality certifications. Promote products and services from the same owner or chain. Informative agenda with the schedule of events, activities. Show the menu of the restaurant, spa services, gym, etc. All available activities and leisure options. 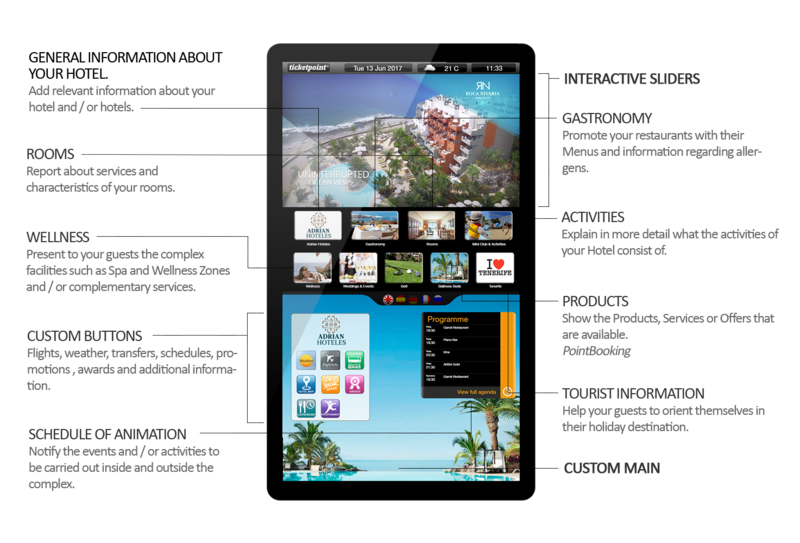 Booking engine with real time availability for resources, activities and restaurants. Provide information upon improvements and upgrades available to the client. What ever you imagine, we make it come true. Integral management service for the contents of our solutions. You just have to worry about getting your ideas to us and we make them real by following your guidelines. We study the needs of visual communication and digital signage that the establishment presents, reducing paperwork costs and achieving a better result. Completely customizable solution, we adapt and personalize the interactive kiosk according to your corporate image, giving a homogeneous look and reinforcing the corporate branding. Our R & D department is continuously designing solutions adapted to new technologies and needs. Our R & D department is continually developing improvements and new functions that help solve the different problems and needs of our clients’ day to day. We remotely monitor all the kiosks and screens, thus being able to act proactively and facilitating the work of our clients at an international level. Optional modules: Dataphone, thermal ticket printer, HD Camera, Card Reader and ContactLess, Barcode Reader. Tell us what your preferences are and we will adapt the kiosk according to your coporate identity. We customize both the software and the external appearance. Find answers to all your questions about our interactive kiosks. Can the kiosk work without an internet connection? Our terminals only need internet connection for: Software and content updates, Google Maps functions and the use of the booking engine. Thus in the case of internet cutting out, the kiosk will continue working normally. In order to guarantee a stable service withou any cut outs, we recommend always a connection via RJ45 network cable. However, at the request of our customers we can install a wifi module to simplify installation in areas where cable installation is not feasible . What happens if the Internet cuts out? Our management software monitors the connection of each of the kiosks in real time, so that at all times we know the status of the terminal connection. Likewise our interactive kiosks are practically autonomous and can work normally even without internet connection, only some functions will be disabled, which need an internet connection for its correct functioning. Can I update the content of the kiosk remotely? Our cloud management software allows you to update the content of the kiosks remotely from a BackOffice accessible from any web browser. Your marketing staff can easily update as many kiosks as you need in an easy and fast way. Can I maintain more than one kiosk in a simplified way? Yes, our cloud control platform allows you to control and manage as many Kiosks as you need. You can have the same information in all of them or offer different services and information in each one. Can TicketPoint update my data and content of the Kiosk? If you do not have marketing staff or you just have a very high volume of work, do not worry, with our content management service, our marketing staff will update the kiosk content for you, always following your instructions. 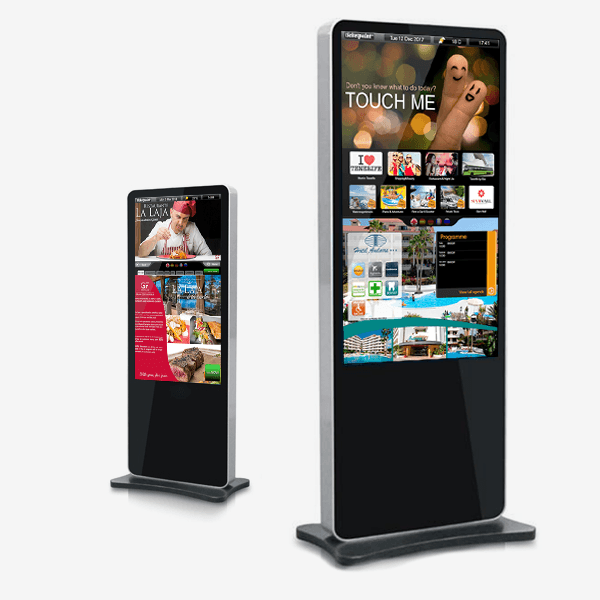 Find answers to your questions before buying your interactive kiosk. Can I purchase the terminal in one payment? The kiosk itself can be purchased without problem through a single payment, for the use of our software platform it will be necessary to pay a monthly or annual license fee, according to your needs. Can I get the kiosks on renting (leasing)? Yes, it is also the option that is best accepted among our customers. Through a 36-month lease, we can include in one single fee the cost of everything you need to enjoy your Interactive Kiosk. Complete insurance even for water, fire, theft, etc. Replacement service in case of breakdown. What happens when the renting ends? When the contracted renting period has ended, we can provide you several options. We remove the material and terminate the contract. We renew the renting for another 36 months under the same conditions, changing the kiosks for more modern and current ones. We renegotiate the contract by adjusting the monthly fee for a more affordable one and keep the current kiosks. Is there any initial cost for the start-up or training? We are transparent, unlike other companies, we do not charge you anything extra for the start-up or initial training. The initial customization jobs are already included. I already have a kiosk, can I use it? Can I buy the kiosk in another place and use your platform? Yes, if you prefer you can buy an interactive kiosk from your usual provider and use our software by paying the license fee only. If you need, we can recommend some minimum characteristics. Can I rent the kiosk for an event of one or several days? Yes, we have a rental service for special occasions. If you have a conference or important event and you want to surprise your assistants or guests, you can rent one or several devices. We are delighted to assist you any all your needs.